This is something I see every day on the way to work. Everybody queuing up to use the escalator while the stairs is all empty. Maybe we should have a musical stairs to encourage people to use the stairs more? It’s also simply because there’s no fun in using the stairs, why use it? It would seem like a chore to actually climb up/down the stairs, wasting your energy to move your joints up and down instead of just standing there were someone else does the job. Until there is a actual ‘reason’ for people to use the stairs instead of the escalator, your escalators will be the one still doing the job. O___O I usually choose the escalator for obvious reasons… but queuing up to use the escalator is ridiculous. Maybe got a evil force pulling us in and forcing us to take the escalator! Why escalator? Go for the stairs! I really don’t like long queue. 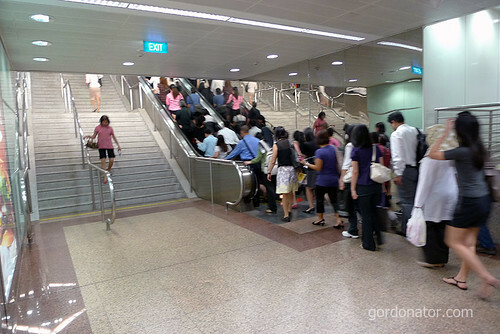 I always see people who just came out of the train, if they see stairs first, they will keep walking straight to the end until they find an escalator to go up ^^; LAZY SINGAPOREANS !! I always seeing people heading for the escalators instead of the stairs. As for myself, I always use the stairs unless the escalator happens to be empty. Sometimes I still use the stairs anyways. me too. the stairs are faster. even when i’m on the escalator, i walk up the escalator as well. Haha, same here. I’m one of those people that rush up the escalator. It’s too slow just standing there. You know, now I want to see someone playing “Dance of the Bumblebee” on those stairs.